John Charles Putrino wanted to keep his cross-country trip simple. 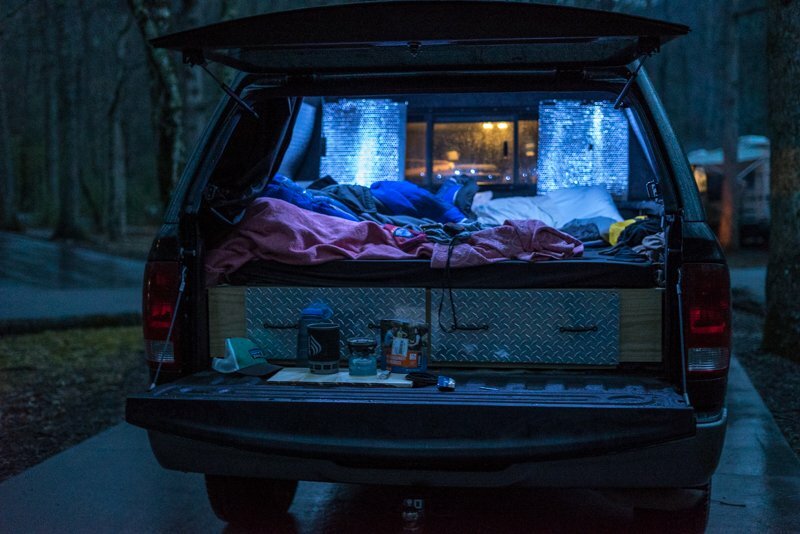 Instead of investing in a pricey camper van to shuttle between national parks, he built a bed and storage unit into the back of his Dodge Ram 1500 truck for just $250. Instead of equipping it with heating or electricity, he opted for thermal blankets, and instead of installing a kitchen of some sort he's having dinners of garbanzo beans and olives straight out of the can. The pleasures of his trip are simple, too. The tangible silence in being the only person for miles. The freedom that comes with carrying everything you need. And, of course, the solitude of the open road. John Charles Putrino was selling heavy machinery in Naples, Florida, when he decided it was time to see more of the country. "A lot of my friends were going overseas and traveling abroad and seeing all these new places, but no one was really traveling in our United States," he said. He quit his job and began turning the back of his truck into a living space using only a small table saw and a drill. "I just went for it," said Putrino, who had no prior construction experience. He built what he calls a "sleeping platform and storage system." The drawers underneath the memory foam mattress hold his camping gear, food, and other supplies. Altogether, it cost $250 to build. He planned his route around national parks across the US. "I used the national parks as a way to keep it simple," he said. "That was the easiest way to plan my route." He started with Congaree National Park in South Carolina. He slept in the parking lot of a trail head, the only person around for miles. He felt uneasy that first night. It was windy, cold, and so dark that he couldn't tell whether or not his eyes were open. But when he woke up the next morning, he felt "amazing." "I was like, 'Wow, I love this, I'm going to keep doing this for the rest of my life,'" he said. "I love being out here all alone." His next stop was Shenandoah National Park in Virginia, where he drove all 105 miles of the scenic Skyline Drive. "That park was gorgeous," he said. "There was no one in there, there was snow on the ground — I pretty much felt like I had the park to myself." After a brief stop in Washington, DC, he continued on to Asheville, North Carolina, to visit the Smoky Mountains. After visiting Mammoth Cave National Park in Kentucky, he splurged on an Airbnb in Nashville to shower, use WiFi, and get a good night's sleep. Even so, living out of his truck-turned-camper without heat or electrical hookups has gone off without a hitch. He subsists on granola bars, canned beans, and a Jetboil cooking system that heats two cups of water. As long as he has fuel, he can remain out in the wilderness without traveling back to get more supplies. "It's definitely something that I recommend doing if you're going to travel on a budget," he said. "And it's quite a head-turner whenever I pull into a campground."